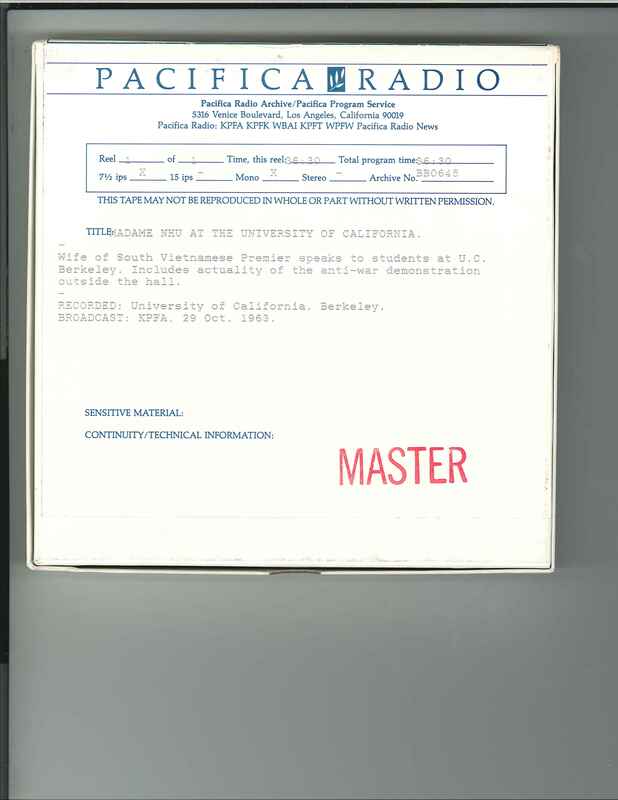 MADAME NHU AT THE UNIVERSITY OF CALIFORNIA. Trần Lệ Xuân (22 August 1924 – 24 April 2011), popularly known as Madame Nhu, wife of South Vietnamese Premier and de facto First Lady of South Vietnam from 1955 to 1963, speaks to students at U.C. Berkeley. In this recording, we hear an introduction from Professor Robert Scalopino, chairman of the Political Science Department of the University. Includes a question and answer session, and actuality of the anti-war demonstration outside the hall. SLATE, a U.C. student group which was involved in the protest, held a rally during which Hal Draper of the Socialist Party and Leonard Glaser spoke. Announcer is Burton White, Pacifica Public Affairs. RECORDED: University of California, Berkeley on October 29, 1963. BROADCAST: KPFA, 29 Oct. 1963. 1 reel (36 min.) : 7 1/2 ips, mono.